When I was a kid I remember wishing particular holidays would last longer than the allotted 24 hours. I wanted to linger longer in the celebrations...and the candy...and the time off from school. As an adult, I feel the same- although a little less candy and I am ok with the kids going back to school. This is where I am grateful for the regular liturgical reminder that the high holy days are actually seasons. They extend beyond a singular calendar square and hold us for a prolonged period of time; they usher us into another time. Easter is no different. Resurrection is more than what happened; resurrection is happening. Easter is more than an isolated moment; Easter is the momentum that propels us forward and towards the Ascension and Pentecost. 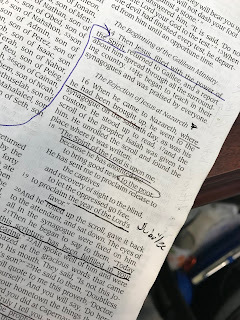 And in these days, when every morning we brace ourselves for the latest news story to break about signs of death or terror or violence or churches and mosques and synagogues burned or bombed, we need the story of the empty tomb to be read on loop. As poet Julia Esquivel writes, in our internal and external "cyclone of a kaleidoscope of struggle" we need "to live threatened with resurrection." This Lent, I covenanted to my own practice of mindfulness as meditation. 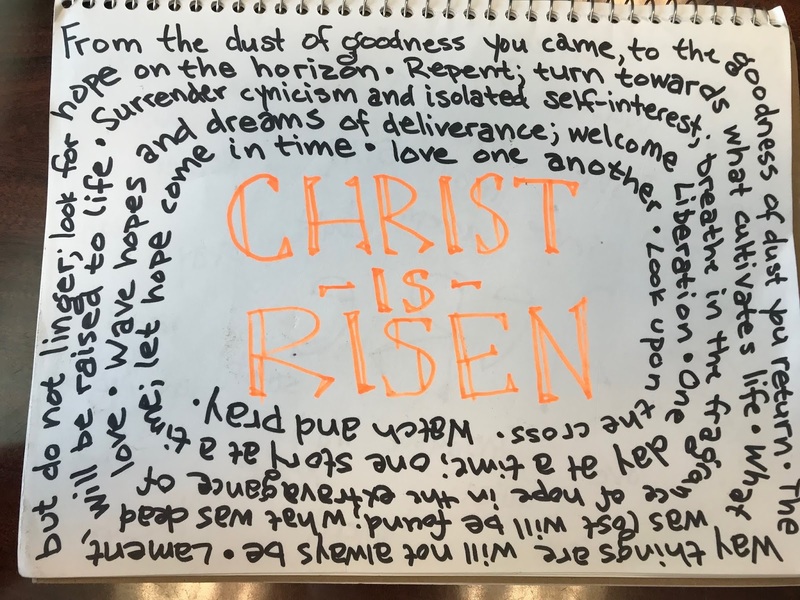 As a part of that journey, I carried sacred phrases shaped by lectionary stories that could hold the space for me as I ventured towards and through Holy Week. The labyrinth of characters became my own kaleidoscope of struggle. The discipline made the final inscription in the center, Christ Is Risen, all the more meaningful and, dare I say, holy. The resurrection did not just show up ex nihilo; rather, anastasia was welcomed in anticipation. Now, as I lean into the Easter season, the pilgrimage continues. Each day, I venture around the narrative created. I linger a bit longer and hold on hope tighter, assured death has not the last word. I commit to read through this before I unlock my phone and encounter the daily newsfeed. Only then will I, and all of us, be able to weather the cyclone of the day and threaten it with resurrection. From the dust of goodness you came, to the goodness of dust you return. / The way things are will not always be. / Lament, but do not longer; look for hope on the horizon. / Repent, turn towards what cultivates life. / What was lost will be found; what was dead will be raised to life. / Surrender cynicism and isolated self-interest; breathe in the fragrance of hope in the extravagance of love. / Wave hopes and dreams of deliverance; welcome liberation. / One day at a time; one story at a time; let hope come in time. / love one another. / Look upon the cross. / Watch and pray. 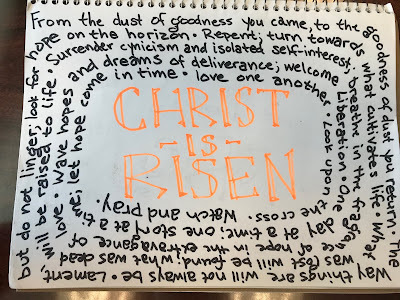 / CHRIST IS RISEN! "Loving-kindness is meant to be done in the easiest way possible so that the experience springs forth most gently, most naturally. To do it in the most easiest way possible means first to use phrases that are personally meaningful...Let your mind rest in the phrases. You can be aware of the phrases either with the breath or just in themselves—the focus of the attention is the phrases. Let your mind rest within them. The feelings will come and go." There are a variety of phrases Salzberg recommends. Check them out here and on a recent podcast with The Liturgists here. For Lent, this is what has been emerging for me, somewhat based on lectionary scripture texts. I will post the final collection during Holy Week. Until then, maybe discern and discover your own phrases for the remainder of the forty-day pilgrimage from cross to empty tomb. May God’s Spirit meet you in the mindful meditations as you dwell in the love of God, neighbor, and self, the essence of what the Hebrew Scriptures call chesed or loving-kindness. A sermon delivered at Trinity United Presbyterian Church in Clifton Heights on Sunday, February 4, 2019. "We need Jesus to come to our sanctuaries, read from the scroll, take his seat among us, and nudge us towards localized expressions of jubilee. 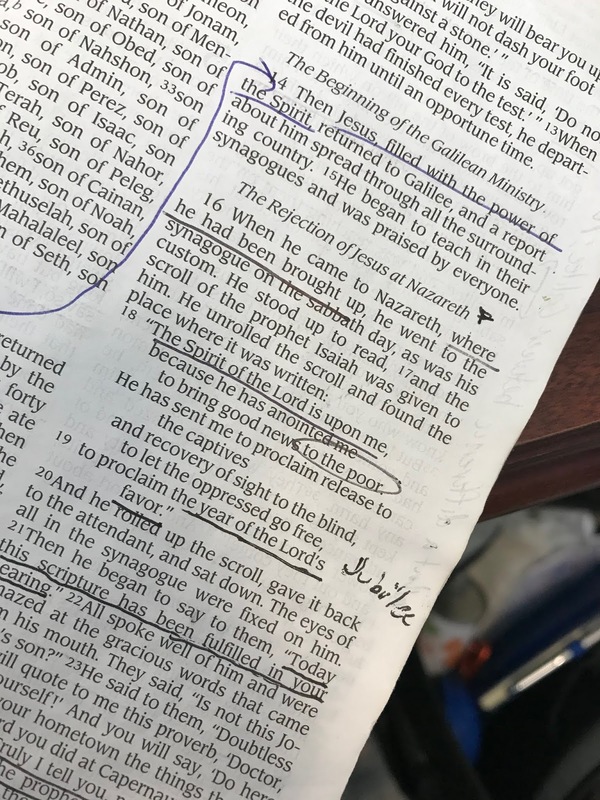 We need the Spirit to come upon us- to help us dream of a gospel not only about life beyond the grave, but also one fulfilled today, in our time and place, the spaces between birth and death, after the creedal comma where we live, struggle, hope, and linger alongside our near and distant neighbors. Faithful saints, we need Luke 4 repeated among us more than once every three years of the lectionary cycle, to remind us our jubilee can only be fully realized when intricately woven within the jubilee of our most vulnerable of neighbors."